Hello and happy Monday. Once again I'd like to share a mood combining both pearl and moonstone, two of the birthstones for June! Sowohl die Perle als auch der Mondstein werden dem Monat Juni zugeordnet. Auch dieses Mal zeige ich wieder beide in Kombination. Schönen Montag für euch! den Mondstein mag ich ganz besonders mit seinem sanften Schimmer und den schönen Blautönen. Welch wunderbare Inspiration. So elegant! June babies are lucky with their birthstones! Mondstein, den mag ich sehr, der gefiel mir schon als kleines Mädchen! Wunderschöne Beispiele hast Du wieder gefunden! Hab eine wunderschöne neue Woche! So lovely. I guess I didn't realize what June's birthstone was even though my mom's birthday is in June. She always wears rubies so I associate those with June. I learned something! Such a pretty combination! 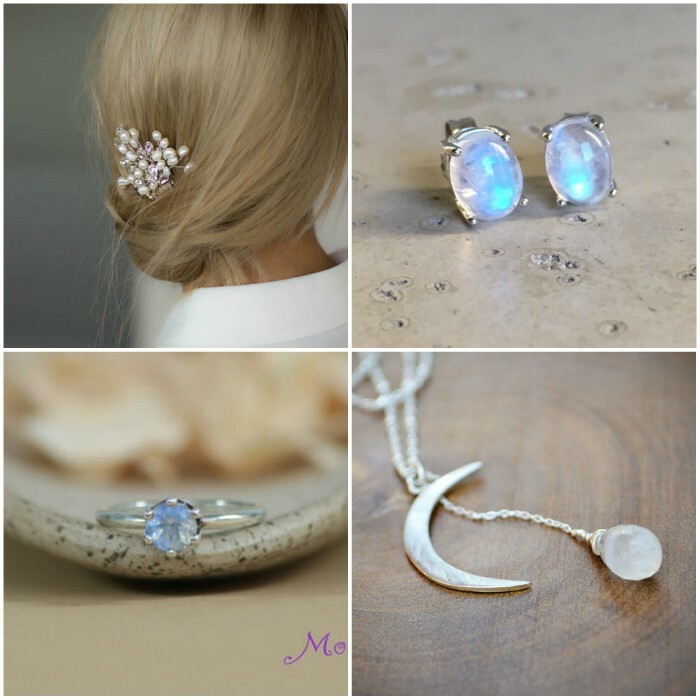 I've been wanting to get some moonstone lately, but haven't found anything locally. I'm hoping to find something on the Mainland. Beautiful! You always find the best jewelry. Ooooh, so pretty! I always enjoy the etsy finds that you find for me! Moonstone is one of my favourites :) nice finds. So beautiful! I love pearl and moonstone too. Beautiful finds as always. I really love the moon necklace. Der Mondstein und auch die Perle mag ich sehr, liebe Duni!